Observed this Wednesday, April 24th. Please take time out to express appreciation to our administrators for the support they provide Kettering Baptist Church: Avis Ali (Church Administrator), Trevionne Bryan (Pastoral Administrator), Rhonda Caldwell (Operations Administrator), and Mae Jones (Financial Administrator). They deserve our appreciation. 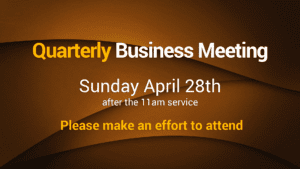 We encourage all Kettering Baptist members to make a special effort to attend our Quarterly Business Meeting on Sunday, April 28th after the 11am Service. These meetings are very informative, and will give you an in-depth understanding of the inflow and disbursement of funds, and ministry activities and needs. VBS is fast approaching and we need lots of volunteers! Sign-up sheets will be available Sunday, April 28th. The Scholarship Ministry is planning an Internship Workshop on Wednesday, May 1st from 7pm - 8:30pm for all KBC high school and college students who are interested in learning more about internship opportunities and how to prepare for interviews. There will be guest speakers, and light refreshments will be served. Observed Thursday, May 2nd, this year's theme is "Love One Another" based on John 13:34. On this day we will be uniting with several other churches in simultaneous reading of the entire Holy Bible from 11:45am - 12noon. All are invited to join in a unified prayer service at Iglesia Roca de la Eternidad Church (4610 69th Avenue, Landover Hills, MD) from 6:30-8:30pm. Flyers are available on the Foyer Table.